Rene and his wife have stashed a priceless portrait, stolen by the Germans, in a knockwurst sausage in their cellar, where two British Airman are also hiding. This intrepid proprietor endures many embarassments and close shaves during this fast moving production, as he summons all the wit he can muster to save his café and his life. This hilarious play is being directed by Jane Dawes and will be staged on Thursday 14th, Friday 15th and Saturday 16th June 2018. 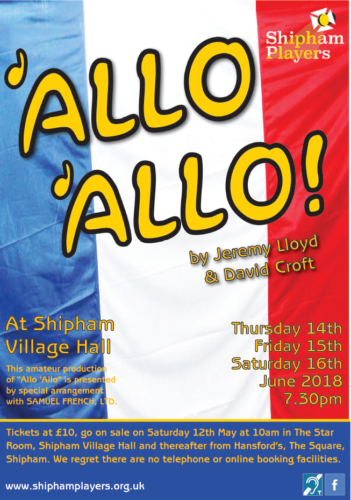 At 7.30pm at Shipham Village Hall. * Note – the Players anticipate that this will be a popular show so are putting on an extra night on the Thursday. Tickets will go on sale on Saturday 12th May 2018 at 10 am in the Star Room at Shipham Village Hall and thereafter from Hansfords, The Square, Shipham.